One of the least known but most influential characters of early American history is the industrialist Samuel Slater. 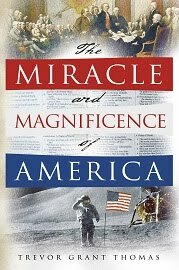 My book, The Miracle and Magnificence of America, details some of Slater’s industrial exploits. One of my significant resources on Slater’s life and work came from author George S. White who, in 1836, published his book, Memoir of Samuel Slater: The Father of American Manufactures. I found White’s book to be a fascinating account of early industrial America. With governments in distraction, and so enfeebled as to exert no force except by the sword and bayonet, vice, disorder, and confusion everywhere prevail. The finest fields in the world for agriculture are suffered to remain barren and desolate, or to be traveled by wandering herds. Indolence and enfeeble the hands and put out the eyes of the inhabitants. Roaming in poverty, filth, and pollution, they are totally blind to their advantages and privileges: they are tossed about by wind of prejudice and passion. Trained to view labour as a degradation, while trampling the most prolific fields and possessing everything requisite, and of the first qualities, for food and clothing, they would be obliged to go naked and starve, were it not for the industry of other nations. As it now is, robbers and assassins fill their streets, and thousands are disappearing by the only species of industry for which they have an adaptation, that of destroying each other. Sounds like much of South America today! Or, if you prefer, and as President Trump allegedly put it, a “shi*hole” (or “shi*house”). In other words, what makes a society a literal and living craphole hasn’t changed much in nearly two centuries. If you want to find the crapholes of the world, one need look no further than where godlessness or leftism—often found together—dominate. Of course, the world’s crapholes are often riddled with poverty. According to Business Insider—and as I alluded to years ago—most of the world’s poorest nations are “under authoritarian regimes where corruption is rampant.” Few things are more synonymous with modern leftism than corruption and authoritarianism. Note as well how many of the poorest and most authoritarian nations are run by Islamists. As I’ve often noted, the godless false religion of Islam is an enforced religion with a violent founder, a violent founding, and a very violent past and present. Islam is generally repressive to women and to those of other faiths. Islam is typically financially devastating and technologically backward, and thus, has produced many of the world’s crapholes. Naturally, the world’s crapholes are filled with filth. Along with garbage, human waste, and nasty water, and no matter what list you use, the world’s dirtiest cities are typically also filled with some form of leftism and spiritual darkness. The same goes for the world’s most dangerous countries. And note again that those plagued by Islam dominate the list. Often accompanying danger and filth is death. Unsurprisingly, the nations with the lowest life expectancy are the same ones showing up on the other craphole lists. Two craphole-producing products of leftist ideology that, in spite of numerous and horrific failures, still plague the world today are socialism and communism. No matter the specifics of the “ism” or the frequency or the scale of the devastation, modern leftists continue to seek to put so much power in the hands of so few. If you think I’m being unfair to the rest of the world, fret not. Tragically amazing—given our vast amount of rich natural and human resources—the United States has more than its fair share of crapholes. Almost always these are municipalities where democrats have ruled for decades and where godlessness—typically accompanied by a good dose of hedonism—and leftism—usually called “liberalism” in America—dominate the landscape. Of course, it’s not the skin color of the people but rather rotten political and religious ideologies that produce toilet-like living conditions. Also, the vast majority of people living in the crapholes of the world are there through little to no fault of their own (except for those who continue to elect democrats) and, in most cases, need the help of others to escape or improve their conditions. The United States can’t import all of those suffering in the world’s crapholes, but we can certainly play a role in exporting what they really need. The surest way to keep people from living in a craphole is to provide them with liberty, but not liberty alone. As the great Edmund Burke put it when observing the French revolution, “The effect of liberty to individuals is, that they may do what they please: We ought to see what it will please them to do, before we risk congratulations.” Liberty should always be accompanied by the “moral chains” provided by Christianity; otherwise you end up with Detroit, St. Louis, Chicago, or Baltimore.